There is little of significance to report today. The stretch of road between Barcaldine and Emerald was uneventful and frankly not all that exciting. We passed through the small towns of Jerico and Alpha. Bryce wanted to visit the post office in Alpha to see if it had a sign out the front "Alpha Mail". It appears the post office manager's sense of humor differs from that of Bryce's. Emerald was much bigger than we had thought it would be with practically one of everything you could possibly need. We decided to head straight to the caravan park at Lake Maraboon. The lake is massive, holding 1.4 million megalitres of water. With plenty of water around the area is relatively green and a number of industries have subsequently developed (cotton, coal mining, citrus orchards...). With school holidays in full swing in QLD the park was pretty full with families and grey nomads. We were definitely the odd ones out. Bryce spent the afternoon drooling over a nearby Toyota Tundra and making enquiries about how the car was imported and converted to right hand drive. It would be an awesome vehicle to complete our next lap whenever that may be! Not doing much to dispel the myth that all Tasmanians know each other, we bumped into Ann-Marie - a nurse I used to work with at the Hobart Private. It was lovely to see her and have a bit of a catch up on the last 8 years! The weather forecast was for storms and the hovering black clouds definitely hinted that it might rain. This didn't last long and once again it was clear blue skies and no rain. No real plan for tomorrow except to slowly make our way towards Mackay. We managed to get packed up before the temperature was in the 30's. Unfortunately we didn't manage to be packed up before the flies were up. Retracing our steps between Winton and Longreach we slowly managed to decrease Hillary's fly population numbers to a bearable amount. Arriving in Longreach we were greeted by a lunchtime street parade. There were fire trucks throwing lollies, reminiscent of Knoppies on Christmas Eve. Dodging the crowds of folk dressed by RM Williams we grabbed a few things at the supermarket, purchased a pie from the Marino Bakery (yummy) and retreated to the air conditioned comfort of Hillary. As temperatures peaked in the 40's we continued towards the gravitational pull of the coast. 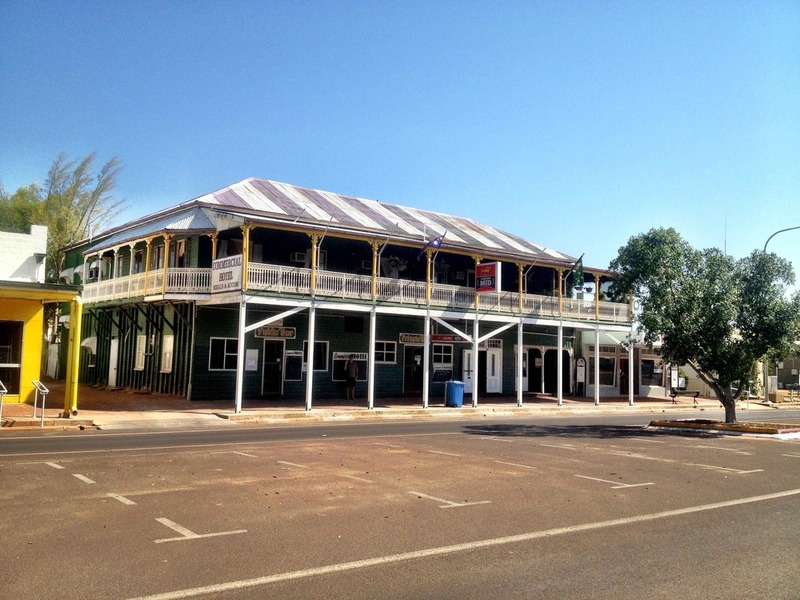 The first thing we noticed arriving in Barcaldine was the number of pubs. 5 in total. All over 100 years old, some of the patrons looked this age as well. Barcaldine's claim to fame is being the founding town of the Labour Party. An 8 million dollar tree of knowledge dominates the main street. The tree stands at the site where the Union Movement resulted in the formation of the Labour Party in 1891. Parking Hillary on some grass in the shade at the Barcaldine Tourist Park we commenced the never ending job of trying to remove some of the dirt from Hillary's internal organs. This will truly be a never ending task. We also added a few more items to the to do repair list. Between cleaning and working out where we head next we chatted with Rex and Pam from New Plymouth, NZ. They had the low down on transporting vehicles in shipping containers from Auckland to Sydney. Might need to apply for a Passport for Hillary! There was footy fever in the park with one TV on the AFL and the other on the NRL and Bryce downloading NFL apps on his phone. Luckily the footy finished prior to F1 qualifying. It even cooled down nicely as the sun disappeared over the horizon. The generator running all night and high temperatures meant that we did not get much sleep. We were awake at 6.50am, packed up and away by 8.30. We thought this was good but 10 km later we crossed into Queensland and lost the half an hour. The Plenty highway evolved into the Donohue Highway at some point, we suspect the border, but the condition did not change. It was not too rough, but the odd bull dust hole made sure that there was no idle scenery gazing. Overall this road was fine and not really a problem for any well set up traveller. By 9.00am it was already 34 degrees so stopping was not really an option. Boulia was our first town after re-entering the sunshine state and it was even hotter. We did some shopping and contemplated staying but by now it was 41 deg so off towards Winton we went. We have thought a lot about our direction from here. South to Bedourie and new roads and places or back to Winton via other new roads. Winton won out as south was going to be hot, dry and dusty. This is also the route we would probably take on another trip through the Simpson and Hay River track. The highway to Winton was a lot more interesting than expected. Lots of wide plains but also hills and finally more trees! We stopped for a quick ale in the Middleton Hotel. A beautiful old pub. After a 600km day we arrived back in Winton to stay at the same park. Mick the owner was as cheerful as ever and put us in our own grassy section away from all the noise. Tomorrow sees us returning down a bit of highway we have already done to Longreach. Then a bit further to Barcaldine and then either continuing on to Emerald or south to Blackall. Our next major town along the Matilda Way was Mt Isa. 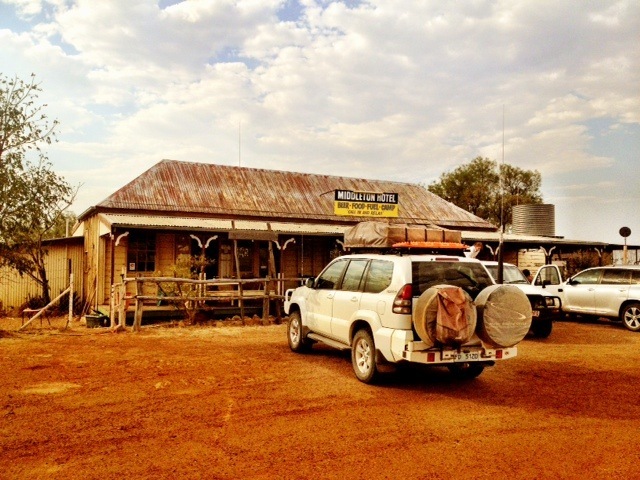 Along the way there were a couple of outback pubs that called out to us. First up was the Blue Heeler hotel at Kynuna. as with a lot pubs out this way there is writing all over the walls, and for a small donation to the RFDS we added ours. Although it was only 11.30am we had a quiet Bundy before heading up the road to McKinley. This town has its claim to fame the pub used in Crocodlie Dundee (the first one). The Walkabout Creek Hotel has indeed walked as it is now down around the corner from where it used to be! A quiet chat with some fellow travellers and another Bundy saw Jaks driving the rest of the way into 'The Isa". We have been here before in 2005 but we didn't remember it much. As it was Sunday afternoon all of the supermarkets had shut by the time we hit town. We had heard good stories about the Overlander Hotel, and as it was walking distance from our camp we settled there for dinner. It turns it was managed by Jason Heares, a friend form the Royal Exchange in hobart, a few years back. A noisy night of passing road-trains saw us pulling up stumps and moving to a new location a bit further out of town. More on that later. We spent the morning wandering around a few 4x4 shops and finally found some solar panels that were at the right price. We can now camp out for several more days without worrying about flat batteries. Excellent. Our new park promised much and sort of delivered. it is like most in the mining areas and has turned itself into a camp for the workers. Travellers now seem to be more of a burden and not as much of a money maker so they are pushed aside. Still, after changing sites because our tent would not fit on the first one we spent the afternoon playing with panels and doing grownup stuff on the computer. The miners returned form their shifts and we thought that things would get rowdy but thankfully they were quiet very early on. The underground mine tour came highly recommended so this morning we donned the orange overalls, gumboots, head torches and hard hats and headed 28m underground into the Hard Times Mine. We were not allowed to take any photos so you will have to use your imagination. The tour was excellent and we got to see lots of old mining equipment being used (not sure about the OH&S issues here). Jaks even got to have a turn using the drill. We resurfaced at lunchtime, restocked both food and fuel and continued west along a relatively boring stretch of road to Camooweal. This weekend is the Camooweal Drover's Festival and the town is beginning to fill up with competitors for the bull branding contest. Sadly we won't be able to stay but looks like it will be a hoot (if you are into that sort of thing). We shared our dinner with Alex, a young chap on a DR400 who rode 970km today. He appreciated a few fresh veggies and something that wasn't cooked in his tiny camp stove. He has to be back in Brisbane by Friday so a few more massive days ahead for him. As for us we will continue our way west to Three Ways and then turn left. We travelled along the Matilda Highway west to Winton. We had a beer at the North Gregory Hotel - the pub where Waltzing Matilda was first performed in 1895. We visited the Waltzing Matilda Centre. We stayed at the Matilda Country Tourist Park. Did you guess? Winton is proud to be the home of Waltzing Matilda. 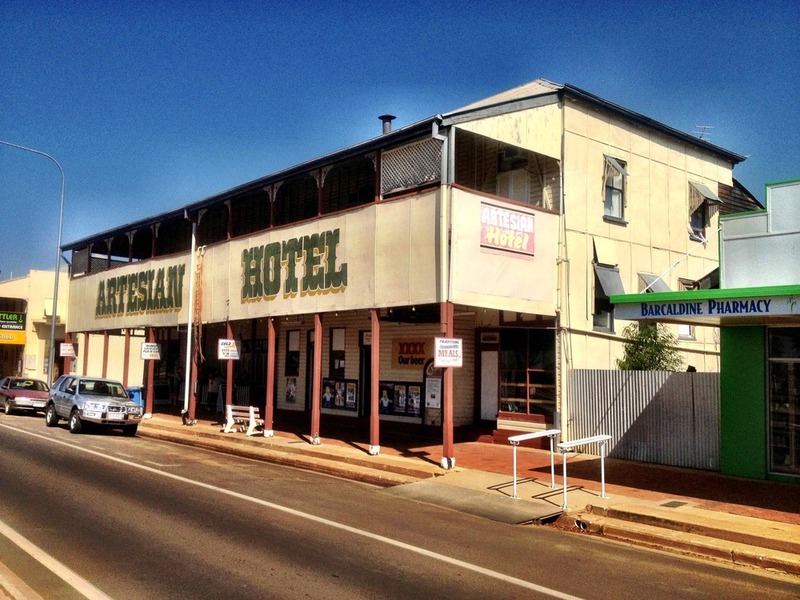 Not only is Winton famous for jolly swagmen it is also the Dinosaur Capital of Australia. A fossilised dinosaur footprint was discovered here in 1962 and people have been visiting here in search of fossils ever since. We didn't peruse this activity as it didn't interest us at all. There seemed to be plenty of folk about town that were keen on dinosaurs and there were museums, shops, fossicking tours and themed cafes to keep them entertained. We did manage to spot a few unidentified species driving white Land Cruisers towing caravans. Winton is a small (population 980) town located in central west Queensland and was our home for the afternoon and evening. Despite a lack of interest in dinosaurs we found plenty to do. The Route of the River Gum took us on a loop drive through the nearby Bladensburg National Park. Didn't see many River Gums but the Mitchell and Flinders grass downs (yes I am copying from the brochure) provided a beautiful backdrop (yes I am still copying from the brochure) for our Saturday afternoon drive. With the sun disappearing down over the horizon the temperature dropped significantly and we retired to the tent to keep warm.